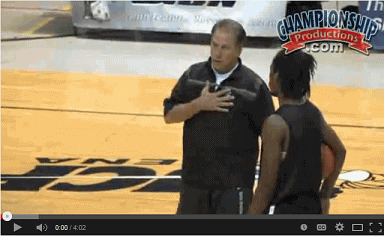 Today's email features several plays used by Coach Tom Izzo at Michigan State. For more, see MSU Sets/Plays in the Premium Members section, which includes 27 plays from Coach Izzo. 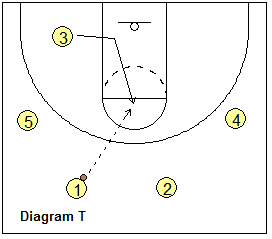 "ISO-3" or "Chest" - O3 flashes to the high post (diagram T) and receives the pass from O1. O1 and O2 X-cut around O3 in the paint (diagram U) and then, using the down-screens from O4 and O5, cut back out to the wings. 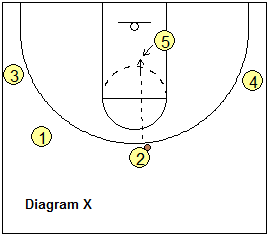 O3 could pass to either cutter, but in the confusion, has a 1-on-1 iso situation with the X3 defender and O3 could either shoot or dribble-drive to the hoop (diagram V). 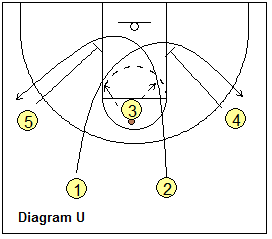 "Hawk" - Using a 1-4 high set (diagram H), O1 passes to O2 and O1 makes the UCLA cut off O4's screen, and could get the pass back from O2. 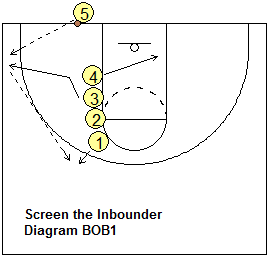 Meanwhile O5 and O3 drop down inside to become double-screeners for both O1 and O4. 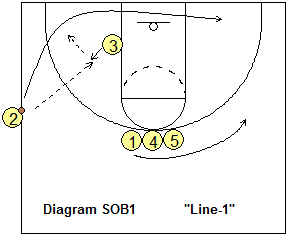 In diagram I, O4 ball-screens for O2, and O2 dribbles around the screen to the middle, and could shoot the jump-shot, or execute a kick-out pass to O1 coming around the O5-O3 double-screen. 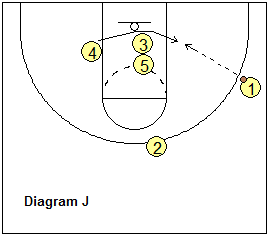 After screening for O2, O4 drops down and cuts around the O5-O3 double-screen (diagram J) for the pass from O1 and the shot. 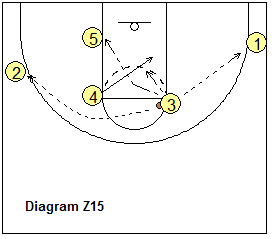 "ISO-5" (Low-Post ISO) - Here's a simple play for O5 inside.... simple plays often work the best. 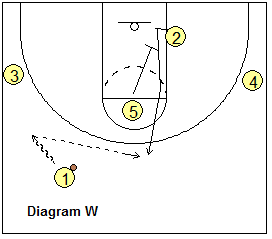 O2 starts on the low block (diagram W) and O5 at the free-throw line. 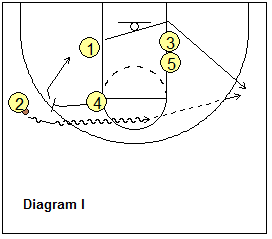 O1 dribbles a little to the left and passes to O2, who comes hard off O5's down-screen. O2 could have a 3-point shot here. 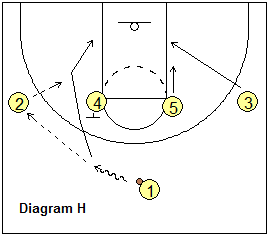 Once O2 receives the pass, O5 aggressively posts-up in the lane for the quick hi-lo pass from O2, and the post-move and inside shot. 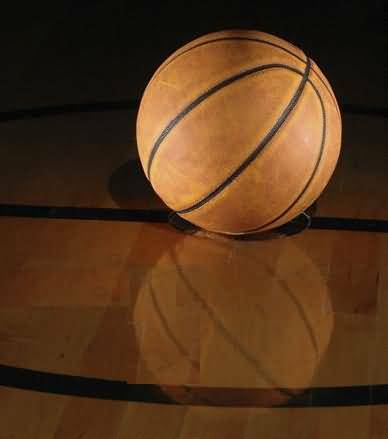 This is high-percentage basketball with a good shot inside, or a chance to get fouled and shoot free-throws. If X2 and X5 switched on the down-screen, O5 might have a size advantage on X2. 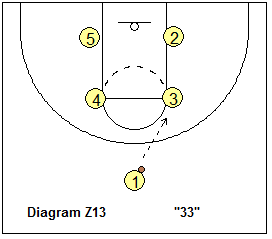 "33" (zone play vs 2-3 zone) - This play uses a different look, a "box" set (diagram Z13). O1 passes to O3 and cuts around O3 (to get the zone to shift to the right). O3 fakes a hand-off, and then O1 moves to the right corner (diagram Z14). Meanwhile, O4 and O5 screen the back-side of the zone (O4 screens the top left defender and O5 screens the outside low left defender). O2 cuts around O5's screen. O2 could get the pass from O3 and the open shot (diagram Z15). 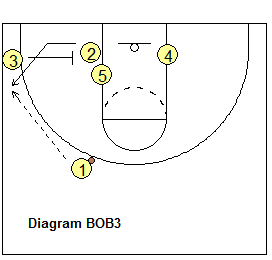 Or O3 could lob-pass to O5, or bounce-pass to O4 cutting through, or pass back outside to O1 for the 3-point shot. 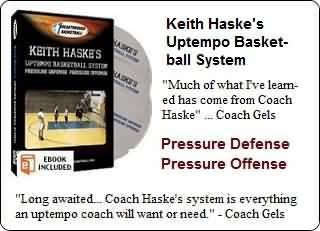 Baseline Out-of-Bounds - "Izzo" - Our high school team has had success with this play, against both man-to-man and zone defenses. 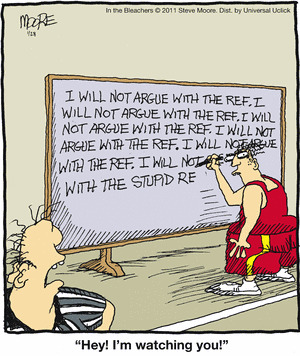 Your best low post scorer is the inbounder. Start in the stack (below). O4 cuts to the weakside block and tries to seal for inside position and a pass there. O3 cuts to the ballside corner and gets the inbounds pass. O1 moves out on top and gets the next pass from O3. O2 screens for the inbounder O5, and O5 cuts around that screen for the pass from O1 and the inside shot. 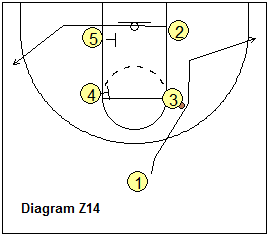 O3 down-screens for O2, and O2 could get an open look at the left wing-corner spot. "Line-1" - We have to include a sideline play. This is good for when you need an open 3-point shot. O1, O4 and O5 line-up as seen in diagram SOB1. 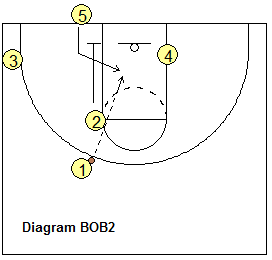 O3 starts at the ball-side block and cuts up a little to receive the inbounds pass from O2. Meanwhile O1 cuts around O4 and O5 to the weak-side wing area. After passing, O2 makes a hard basket-cut for the possible give-and-go play with O3. If the give-and-go is not there, O2 continues to the opposite corner. 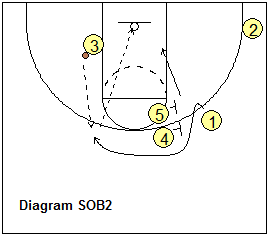 O1 fakes the basket-cut, reverses direction and comes over the O4-O5 double-screen (diagram SOB2). 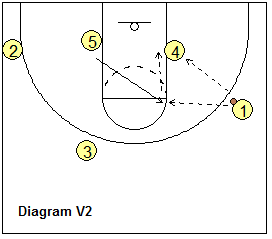 O1 is often open for the 3-point shot here. 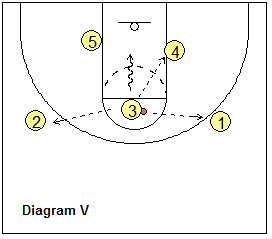 O5 can slip the screen for the pass from O3. 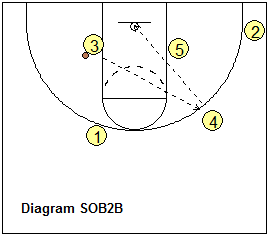 O4 might also be open for the 3-point shot (diagram SOB2B). Social - Join us on Facebook, Google+, Twitter, and Pinterest!